‘You have been elected Chairman of the Board. Give every player £50’. This was always one of my favourite ‘Chance’ cards in the ever-popular board game. My son picked it up the other day. I never understood. Is that what the Chairman of the Board does, give away money? I thought he was there to make sure they made it? At least I knew that money-making businesses need Chairmen. I didn’t know that string quartets do too. According to this intriguing story, reported in the excellent Limelight magazine, the Australian String Quartet has lost two of its members. These things happen, and are generally filed, as they are here, under ‘irreconcilable artistic differences’, though it’s hard not to think of the Amadeus String Quartet surviving 40 years despite two of its members cordially loathing each other for much of that time. The Australian String Quartet – for now. For many quartet members, the ensemble is like a marriage, not a business. You make it work not because your boss is telling you to, but because you want to. You invested something of yourself in it, you know there are wonderful things about it, and more than anything you want it to succeed. So you plug on. That’s not the way the ASQ is run. I use the passive verb advisedly, because its members are appointed by a 10-strong board of directors, with the privilege of playing a matched set of Guadagnini instruments. The directors have done useful jobs like running private equity companies and large wineries. The quartet has an operations manager. It’s all a far cry from hitching rides with each other and appointing the least-disorganised member to book the hotel rooms – the cellist David Waterman has written beautifully and from personal experience here and in here about the psychological dynamics of a long-lived quartet. Perhaps the relief from administrative tedium frees up more time for the valuable work of the ASQ in promoting ‘local’ composers, alongside the classics of the repertoire. Waterman’s experience, and it’s shared by others, suggests that some grit in the oyster is needed. It’s a sad story, but the telling phrase comes from Paul Clitheroe, the ASQ’s Chairman of the Board. 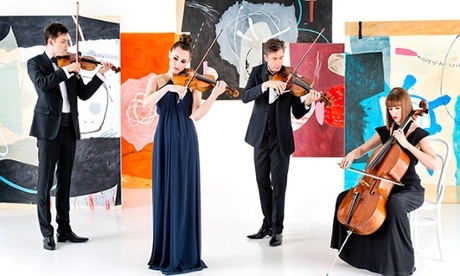 ‘After careful consideration, the Board of the ASQ has appointed violist Stephen King and cellist Sharon Draper to lead the Quartet into the future.’ So the remaining members have their jobs – for now. In its 29-year-history the ASQ has had sixteen members. That’s a complete turnover of membership every seven and a half years. Maybe such a lifespan is common for small ensembles. By definition it’s hardly a recipe for lasting artistic success.